1/2 fresh pineapple, cut it into 1/2 inch cubes. 1 small yam, cut it into 1/2 inch cubes and boiled. 1 cucumber cut into 1/2 inch cubes. 3 fresh red chillies, seeded and chopped. Mix the brown sugar, tamarind juice and red chillies. 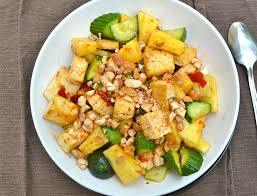 Place the pineapple, yam and cucumber in a bowl. Finally serve the delicious rojak. Rojak is also known as Rujak in Indonesian spelling. It is a traditional fruit and vegetable salad dish. It commonly found in Indonesia, Malaysia and Singapore. It is very simple to make. It is also used as a colloquial expression for an eclectic mix. It is specially as a word describing the multi-ethnic character of Malaysian and Singaporean society. Rojak is a mixture of fruits, vegetables, nuts, less commonly meat. And they are all dressed up with paste. This the combination of different ingredients. That differ from vendors to vendors. Usually ingredients like guava, cucumber, pineapple, turnip, bean sprouts, puffy deep-fried taught. And the Chinese dough fritters are used to make rojak. Rojak is very beneficial for health. It usually provide the benefits of consumption. And they reduce the fat. And reduce carbohydrate consumption.